At the request of the neo-conservative association Judicial Watch, the US Department of Defence released the full version of the September 11th, 2001 attacks on Pentagon. The neo-conservative press is delighted at this broadcasting, which supposedly contradicts conclusively our analyses. In fact, the video does not contain any additional element in comparison with the images already broadcast in 2002, and where it is still impossible to see a Boeing 757-200. This sequence confirms, on the contrary, the analysis of the former artillery officer Pierre – Henri Bunel published by Thierry Meyssan in his book Pentagate, and that we reprint here today. Pierre-Henri Bunel is a graduate of the Ecole Militaire de Saint-Cyr (the French officersâ€™ academy) and a former artillery officer, whose expertise is recognized in the following fields: the effects of explosives on humans and buildings, the effects of anillery weapons on personnel and buildings, firefighting for specific types of fire, wrecks and remains of destroyed airplanes. He participated notably in the Gulf War, at the side of Generals Schwartzkopf and Roquejoffre. 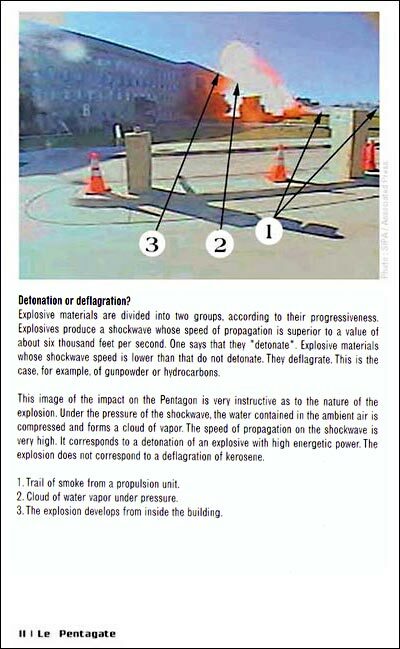 What is the nature of the explosion that took place at the Pentagon on 11 September 2001? 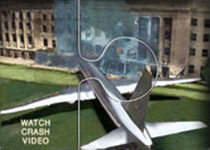 An anâ€™alysis of the video pictures of the impact and the photographs of the damages permits one to know by what type of device the attack was caused. Did the explosion correspond with that produced by an airplaneâ€™s kerosene or that of a real explosive? Did the fire correspond with a hydrocarbon fire or with a classic blaze? As a preamble, it seems indispensable to make clear to the reader an essential distinction: the difference between a deflagration and a detonation. The combustion of explosive chemical materials – powders, explosives or hydrocarbons, for example – release energy by producing a shock wave. The diffusion at high speeds of the enormous quantity of gas produced by the chemical reaction is accompanied by flame, by a noise caused by the displacement of the shockwave through the air, and by smoke. One also often observes, even before seeing the flame, a cloud of vapor due to the compression of the air surrounding the zone of the explosion. The air canâ€™t be set into motion immediately, so it compresses under the influence of the shockwave. At first, under the compression of the air molecules, the invisible water vapor that the atmosphere always contains in greater or lesser quantities compresses and becomes visible as a white cloud. What I would like to underline here is the notion of the shockwave. An explosion is a reaction that projects gas at a greater or lesser speeds. Explosive materials, according to their chemical composition and the physical arrangement of their molecules, impart upon the gases they generate a greater or lesser speed of propagation. One says that they are more or less progressive. The observation of the shockwave is thus a precious indication of the speed of the gases projected by the explosion. Explosive materials are divided into two groups, according to their progressiveness. Explosives produce a shockwave whose speed of propagation is superior to a value of about six thousand feet per second. One says that they "detonate". Explosive materials whose shockwave speed is lower than that do not detonate. They deflagrate. This is the case, for example, of gunpowder or hydrocarbons. In an internal combustion engine – and the turbojet of a Boeing 757 is a continuous internal combustion engine – the fuel under pressure deflagrates and does not detonate. If it detonated, the engineâ€™s structure would not withstand it. The kerosene of an airliner that crashes ignites and does not generally produce even deflagration, except in certain circumstances and at points limited to the engines. In the recent case of the Airbus that fell on a Queens neighborhood in New York in November 2001, the engines did not explode upon arriving at the ground. Kerosene is a heavy oil analogous to diesel fuel, tri-filtrated in order to satisfy the physical conditions of passage through the fuel injectors of jet engines. It is in no sense an explosive. The color of explosions as also fairly remarkable. In detonations, the shockwave displaces itself rapidly. If the explosion occurs in the air without obstacles, the flame is often pale yellow at the point of the explosion. As it moves away from ground zero it turns orange then red. When it encounters obstacles, such as the walls of a building, one practically doesnâ€™t see the pale yellow part. The duration of illumination by this color is brief. The form of the flame gives an impression of "rigidity" because of the speed of propagation. It is only when the dust lifted by the shockwave starts to bum due to the brutal rise in temperature that smoke appears. This is fire smoke that has little resemblance to the black, heavy coils given off by hydrocarbon fires. But solid explosives are not simply chemical combinations. One can improve their effectiveness by playing with their physical forms. In principle, the shockwave propagates perpendicularly to the surface undergoing reaction. By working the shapes of the explosive charges one can orient the shockwave in such a fashion as to send a maximum of energy in a given direction, like directing the light of a lighthouse with a reflector. We thus find spherical charges whose shockwaves go in all directions; cylindrical charges like those that equip shrapnel shells, those weapons that burst into minuscule pieces of steel the size of a tab of chocolate and spray the battlefield; t1at charges, that allow making holes in plane obstacles with a minimum of energy lost in useless directions; but also hollow charges. These latter concentrate the principal shockwave in the shape of a high-temperature jet bearing a quantity of energy capable of piercing armor made of steel, composites or concrete. The explosive that constitutes the weapon  should explode at the desired time. In order for it to react exactly as the user wishes, it needs a certain degree of stability. The explosive that constitutes the principal charge of a weapon is too stable to explode by a simple shock. In fact, to initialize the chemical reaction, the charge must be submitted to a shockwave provoked by a more sensitive and less powerful explosive that we call the detonator. The explosive charge of the detonator reacts to a shock, to a spark or to an electrical or electromagnetic impulse. It then creates a shock wave that provokes the detonation of the principal charge. The system that commands the explosion of the detonator is called the ignition system. The devices vary considerably and it would take too long to examine all of them. I will thus only deal with the two systems that might have been used at the Pentagon, explosive ignition systems commanded by the operator and ignition systems for hollow charges by instantaneous percussion with a short delay. Shells, bombs or missiles are equipped with an ignition system which comprises the release, the delay system and a detonator. This device is called a fuse. It is fixed on the weapon either during its construction, or at the moment of conditioning for firing. It includes a security system that prevents the ensemble from functioning until being armed. The release can be activated by a shock in the case of percussion fuses, by a radar detector at a distance in the case of radio-electric fuses, by the reaction to a source of heat or a magnetic mass in the case of thermal or magnetic fuses. Either the release provokes detonation instantaneously, or the delay system acts so that the weapon only detonates several milliseconds after the impact. In this last case, the weapon begins to penetrate the objective by physically denting it with its armor. The charge detonates once the weapon has already entered the objective, which increases its destructive effect. For certain very hard fortifications, one even finds that there are multi-charge weapons. The first charges fracture the concrete, while the later one or ones penetrate and detonate. In general, anti-concrete charges are hollow charges. The jet of energy and melted materials penetrate the fortification and spread inside quantities of hot materials pushed by a column of energy that pierces the walls like a punch. The great heat produced by the detonation of the hollow charge provokes fires in everything that is combustible inside. During the Gulf War, the anti-fortification missiles and guided bombs pierced all of the concrete bunkers that were hit, notably at Fort As Salman. A single bomb could pierce through three thicknesses of armored concrete, having begun with the thickest, on the outside. In order to conduct an attack with such a weapon system, a launcher is obviously needed. In the case of guided bombs, the launcher is a plane or at the very least a powerful helicopter. The weapon then leaves with an initial speed which is that of the carrier vehicle. It descends in a glide and generally guides itself by following a laser illumination. In the case of a missile, its range is much greater because the missile has its own engine. If needs be, one can conceive a system so that the missile depart from its own launch pad on the ground. There are in fact ground-to-ground anti-fortifications missiles. A cruise missile of a recent model generally follows three phases of flight. The launch, during which it attains its tlight speed in emerging from the bay of an airplane or a missile launch-tube. Pushed forward by the engine at full power, it reaches its cruising speed and deploys its wings and tail fins. It then descends to its cruising altitude and follows its approach trajectory. In the course of this flight phase, it frequently changes direction, turning according to the Hight program, climbing or descending to remain low enough to escape detection as far as possible. One might then mistake it for a fighter plane in tactical Hight maneuvers. It keeps this altitude until it reaches the point of entry to the terminal phase. This point is situated a certain distance from the objective; two or three miles depending on the models. From this point, the missile flies in a straight line t?wards the target and undergoes a strong acceleration that gives it maximum speed to strike the objective with the maximum of penetrative force. The missile thus has to reach the point of entry to the terminal phase with great precision, so that before acceleration it is not only in the right spot but also pointing in the right direction. That is why it often happens that the missile ends its cruising flight with a tight turn that allows to adopt the right alignment. A witness might observe that the missile reduces its engine power before throttling back up. On 8 March 2002, a month after the beginning of the controversy on Internet and three days before The Big Lie was published in France, five new images of the attack were released by CNN . A photo agency then distributed them very widely to numerous newspapers throughout the world. These images originating from a surveillance camera were not made public by the Pentagon itself, which contented itself with authenticating them. 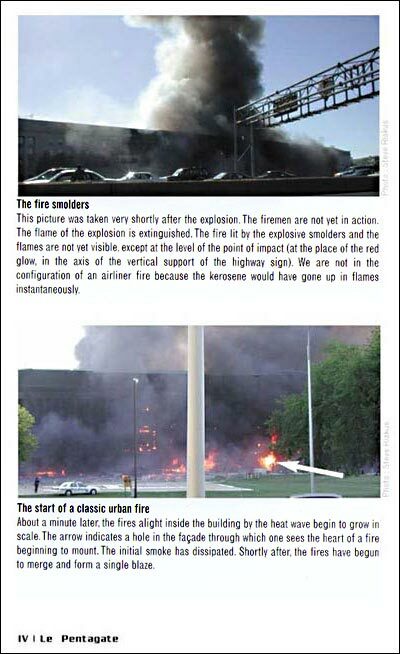 In them, one can see the flame developing from the impact on the faÃ§ade of the Department of Defenseâ€™s building. The first shot (Photo Section, p. II) is that of a white puff that seems to be a white smoke. It definitely calls to mind the vaporization of the water contained in the ambient air at the beginning of the deployment in the atmosphere of a supersonic shockwave of detonating material. One distinguishes, however, traces of red flame characteristic of the high temperatures reached by the air under the pressure of a rapid shockwave. What is plain to see is that the shock wave starts from the interior of the building. One sees above the roof the emergence of a ball of energy that isnâ€™t yet a ball nf fire. One might legitimately think of a detonation by an explosive with a high energetic power, but for the moment it still cannot be determined whether it is a charge with a directed effect or not. One distinguishes at ground level, starting from the right-hand side of the photo and going to the base of the mass of white vapor, a white line of smoke. It looks very much like the smoke that leaves the nozzle of the propulsion unit in a flying vehicle. As opposed to the smoke that would come out of two kerosene-fueled engines, this smoke is white. The turbojets of a Boeing 757 would in fact leave a trail of much blacker smoke. The examination of this photo alone already suggests a singleengine flying vehicle much smaller in size than an airliner. And without two General Electric turbopropulsion units. In the second shot (Photo Section, p. III) one still sees the horizontal trail of smoke but one can also make out very clearly the development of the red flame. 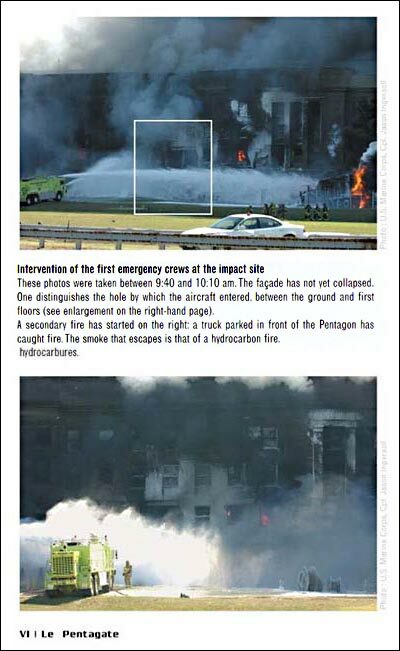 It is interesting to compare this shot of the impact at the Pentagon with that of the impact of the plane with the second tower at the World Trade Center (Photo Section, p. 1II). The color of the latter is yellow, which points a lower temperature of combustion. It is mixed with black, heavy smoke. It is the color of hydrocarbon combustion in the air. In this case, it is kerosene contained in the airplane that is burning. This flame descends quite slowly down the front of the facade where the plane had penetrated, carried by the falling fuel. In contrast, the flame of the Pentagon explosion rises sharply from inside the building, ripping off debris that one sees mixed with the red flame. There is no longer the cloud of vapor due to the shockwave that masked the flame in the first photo. The intense heat has caused it to evaporate. As we have seen, that is characteristic of detonations of a high-yield explosive. We should take the opportunity here to note the appearance of the smoke rising from the first tower that was hit, as the fire develops there. It consists of heavy, oily coils. As for traces in the air of the airplane, as opposed to the aircraft that seems to have hit the Pentagon. there is no trail although the impact has just taken place. The photos on page IV of the color section were taken a short time after the explosion. The firemen are not yet in action. In the one at the top, the flame of the explosion itself has extinguished. The fire llt by the explosion smolders and its flames are not yet visible, except at the level of the point of impact, where one perceives a red glow in the axis of the vertical support of the highway signs. We are thus not seeing the configuration of an airliner fire because the kerosene would have ignited instantaneously. The fa,ade has not yet collapsed. It does not present any visible signs of major mechanical destruction, although the upper floors and the roof have already been hit by the blast. In the photo below, taken according to its author about a minute later, the fires ignited inside the building by the heat wave have begun to spread. The arrow indicates a hole in the fayade through which one sees the heart of a fire beginning to mount. The faÃ§ade still has not collapsed and the initial smoke has dissipated. It is only after the fires have begun to merge and fom a single blaze that the thickest smoke appears, but without presenting the same appearance as the smoke from an airliner fire with its reservoirs of kerosene. To sum up, the examination alone of these photos that everyone has seen in the press permit one to measure the striking differences between the two explosions. 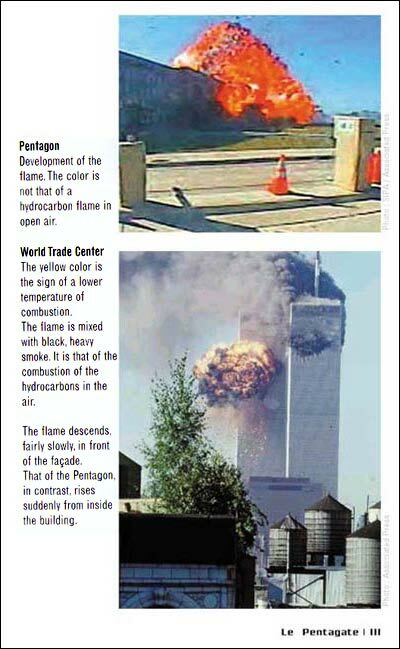 If the flame of the World Trade Center is obviously that of kerosene from an airplane, it would seem that this is not at all the case at the Pentagon. The flying device that struck the Department of Defense has, at first sight, nothing to do with the airliner of the official version. But we have to continue the investigation in order to progress in our search for elements that will perhaps permit us to determine the nature of the explosion that damaged the Pentagon. When the firemen intervened on the site, one sees clearly that they are using water to attack the fire (Photo Section, p. X). Several official photographs show a fire truck that we in France would call a CCFM (carnian citerne pour feu moyen – a tanker truck for a medium-sized fire). The water coming out of the hoses is white in color, so it does not contain that substance used on certain fires known as a "retardant". In general, retardants give the water a reddish or brownish color. Thus the principal fire being attacked is not a hydrocarbon fire, because one cannot see any foam cannons that are characteristic of interventions in airplane accidents or any hoses projecting adapted products. 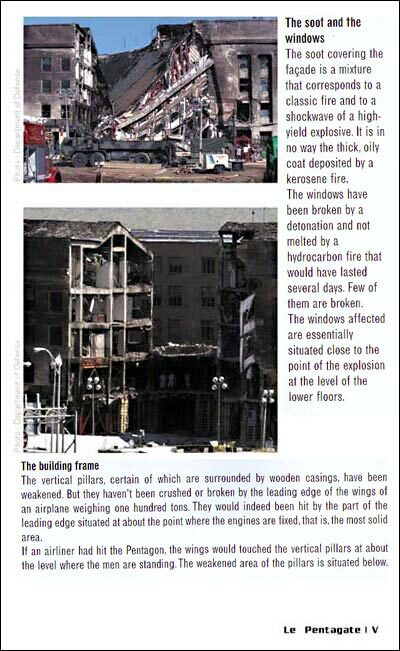 However, the examination of the photo at the top of page VI does show the residues of carbonic foam, The explanation is given in certain accounts of September 11 according to which either a helicopter, for some, or a truck, for others, parked close to the fayade, exploded. One can see in any case on many pictures a truck on fire to the right of the impact. On the other hand, the quantity of foam residues is relatively small. Essentially, it is spread not on the building fire but on the lawn that stretches in front, as if they had extinguished a fire set alight by that of the attack. This is what is known as a "sympathetic fire", in French firemenâ€™s jargon. A foam hose was thus used to put out one or more secondary fires. One can see in the pictures released by the Department of Defense a truck armed with a foam cannon attacking a fire situated in front of the faÃ§ade, while the high-powered water pumps attack the main fire inside the building. The spraying as it is being carried out at that moment manifestly aims at lowering the general temperature by wetting everything first, before penetrating into the building to extinguish fires point by point. After having given my reactions as a fonner firefighter, Iâ€™m now going to give those of an artillery officer and observer. Among his tasks, an artillery observer must pick out objectives, estimate the type of weapon needed to be deployed to treat them and the quantity of projectiles required to render them harmless. Once the objective has been treated, one must still evaluate the real damage to measure whether the first strike was sufficient or if firings should continue. Itâ€™s a matter of establishing an appraisal of the damages that is then transmitted to the command and intelligence echelons. This evaluation of battlefield damages is called in English a Battlefield Damage Assessment (BDA). One must, of course, employ maximum objectivity in these evaluations: it would be stupid to ask for more firings on an objective that had already been neutralized or destroyed, but just as stupid to let it be thought that an objective had been rendered harmless when it still presented a menace. During the Gulf War, every day there was a meeting in General Schwartzkopfâ€™s command post between the French, British and American commanders-in-chief. A part of the "intelligence" chapter of this briefing dealt with the examination of BDA photos. And Schwartzkopf paid particular attention to this. In these pictures one saw the effects of weapons and the scale of damage inflicted on the objectives. This was not mere voyeurism on the part of the three generals. It permitted them to decide if there was reason to continue attacking objectives already treated, but also to decide whether to use less powerful weapons in order to prevent the destruction inflicted on military objectives from impinging on the civilian environment. Needless to say, for the interpreters of images, artillery observers and intelligence officers, damage evaluation was a key matter that we studied carefully. And when one adds practical experience to theory, as unfortunately was my case, one does possess some elements of objective appraisal in examining the damage suffered by a building; especially if one knows the building well, as is also true in my case concerning the Pentagon. A general view of the faÃ§ade is highly interesting. Furnished again by official bodies, it is presented at the top of page V of the Photo Section. As the firefighters finished working on the exterior of the building, one can make out several instructive elements. First of all, the soot covering the fayade is a mix of that which would have been deposited in a classic fire and others more characteristic of those deposited by the shockwave of a high-yield explosive, but in no way of the thick, oily coat deposited by a kerosene fire. The windows have been broken by a detonation and not melted by a hydrocarbon fire that would have lasted several days. The most remarkable thing is that relatively few of them are broken, and that the windows affected are essentially situated close to the point of the explosion at the level of the lower floors. Near ground zero, therefore. It is very likely that the shockwave was propagated along the corridors, and one follows it very well in the general overview shown on page XI of the Photo Section. This corroborates the testimony of David Theal . This liaison officer at the Pentagon describes the sudden arrival of a violent noise accompanied by debris that ravaged the corridor outside his office. At the beginning of its displacement, the shockwave broke panes and, once it was channeled by the walls of the corridors, it took an orientation that no longer had as much effect on the windows. It should be made clear that these were double-glazed windows in which the outer pane is particularly solid. That was what a representative of the company that installed them declared , and itâ€™s also what was explained to me well before this attack, during an official visit to the Pentagon as an observer. On a picture that is a more detailed close-up, at the bottom of page V, one has a view of the impact zone after wreckage was cleared. It allows one to make out the vertical concrete pillars of the buildingâ€™s frame and the corridors that fun along the floors. One understands better then how the shockwave bypassed the windows as we mentioned above. The shot shows that the vertical pillars, some of which are surrounded by wooden casings, have obviously been weakened at the ground level, that is, the place where the detonation occurred. But they werenâ€™t crushed or broken as would have been the case if they were struck by the leading edges of the wings of a hundred ton airplane. They would have been hit by the part of the leading edge situated approximately at the spot where the engine pods are fixed, the most solid area. Manifestly, no wing has struck these vertical pillars of the buildingâ€™s concrete frame. If a plane had struck the Pentagon, as the official version would have us believe, the wings would have touched the vertical pillars at approximately the level of the floor on which one can see men standing. Itâ€™s obvious that the weakened zone of the pillars is located below, where one can see the wooden casings and the red-colored steel props. So the vehicle that carried the charge that weakened the pillars struck lower than an enormous airliner would have done. And r refer you back to the first photographs studied on which we could see the trail of smoke from a propulsion unit very close to the ground. This picture also permits us to put into context statements by certain experts, according to whom "the Pentagon is constructed of particularly solid materials". Itâ€™s true that the buildingâ€™s contractors used hardened materials for the windows and the outer facings, but the Pentagon is no more a blockhaus than an armor-plated car is a tank. The last photo was produced by the Department of Defense and published on a Navy Web site . It is presented on page XII of our Photo Section. In examining it, one can see an almost circular hole topped by a black smudge, This perforation is about seven feet in diameter and is situated in the wall of the third line of buildings working inward from the faÃ§ade. It is supposed to have been made by the nose of the plane. That would mean that the nose of the aircraft, a radome of carbon fiber that is far from being armored, would have traversed without destroying them six load-bearing walls of building considered to be rather solid. And what would then be the cause of the black smudge marking the wall above the hole? The hydrocarbon fire. But then, all of the faÃ§ade of this building would be marked with soot and not only the few square feet that have been really blackened. And the broken windows, was that the result of the impact? I remind you that the windows are solid. The appearance of the perforation in the wall certainly resembles the effects of anti-concrete hol low charges that I have been able to observe on a number of battlefields. These weapons are characterized by their "jet". This jet is a mixture of gas and melted materials that is projected in the direction of the axis of the paraboloid that constitutes the forward face of the weapon. Propelled at a speed of several thousand feet per second, with a temperature of several thousands of degrees, this jet pierces concrete through many feet of thickness. It could thus pierce five thick walls of the building without any problem. Five walls out of six because the fayade was perforated by the vector itself. The detonation of the military charge only occurs, in fact, once it has been carried inside the objective. As I eXplained earlier, the fuses arming anti-concrete charges are not instantaneous, but have a short delay. That is why the flame of the explosion developed from within, the interior of the building towards the exterior. As one sees on the photos taken by the security camera, the shockwave damaged the fa,ade, the upper floors and the roof, and propagated itself through the corridors at the height where the vector had struck: on the ground level. The jet contains gases at a high temperature that slow and finally come to a halt before the melted materials. The gases burn everything combustible in their path. A schematic diagram of the flame and the jet of a hollow charge that is piercing walls is shown on page XIII of the Photo Section. The melted materials travel further than the gases, and in this particular case, the picture of the last hole certainly resembles the effect that the melted materials of a jet would have had at the end of their trajectory. They would have been finally stopped by the last wall they reached. But still fairly hot enough, they would have marked the wall with this black smudge, just above the hole. Heat rises from materials that are beginning to cool and thus only mark the fayade above the impact. At this terminal point, the temperature is no longer high enough to make more of a mark on the cement. On the other hand, the remnants of the shockwave still have enough energy to break the windows immediately around the hole. One understands then why the firefighters intervened with water. It is the extinguishing t1uid with the strongest heat-to-mass ratio. It is thus the best -adapted to cooling materials that have absorbed a "heat wave" and to extinguish fires in urban areas that have been lit by sympathy. It was not a matter of the firefighters extinguishing a hydrocarbon fire, but of putting out punctual fires and cooling overheated materials. This photo, and the effects described in the official version, lead me therefore to think that the detonation that struck the building was that of a high-powered hollow charge used to destroy hardened buildings and carried by an aerial vehicle, a missile. Pentagate is fully accessible in both PDF and HTML formats, free of charge, on the website Pentagate.info. Pentagate is also available in the Voltaire Network online bookshop. In military language, the ammunition is the ensemble of the propulsive charge and the projectile. The weapon is the launcher for small caliber launchers. and the projectile itself for large caliber weapons systems. Thus the weapon of an artillery man is the sllell or the missile, not the cannon or the launch pad. â€™DoD News Briefing on Pentagon Renovationâ€™, Defense Link, Department of Defense, 15 September 2001: http://www.defense1ink.mil/news/Sep… . â€™War and Readinessâ€™, All Hands, magazine of the US Navy: http://www.mediacen.navy.mil/pubs/a….